There is a long forgotten a time in history that still hides in plain site, where burial tombs of the ancients still scatter across the Bulgarian landscape. From beautifully adorned walls to grand and skilled goldworks, the lost civilization of the ancient and powerful Thracians has baffled and eluded scholars for centuries under seemingly simple earth mounds and hills. 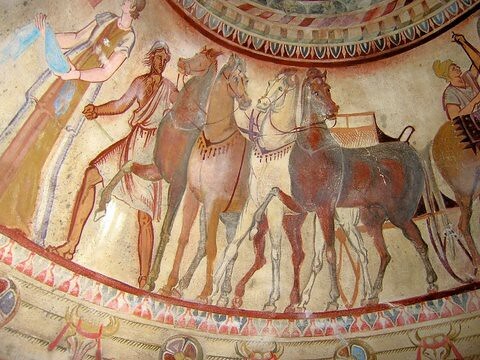 Only now is the lost and forgotten history of the Ancient Thracian civilization becoming slowly uncovered as more and more Thracian burial tombs are investigated and researched across the Balkans, especially in Bulgaria. 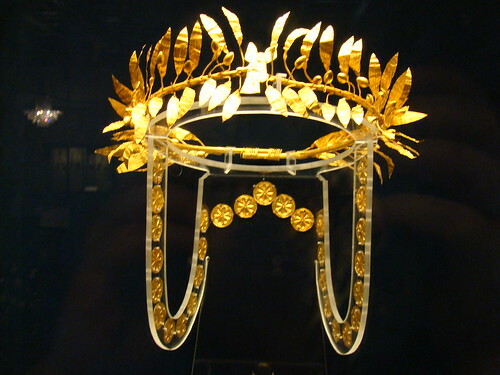 What we actually know of the ancient Thracian people is very vague and conspicuously limited. We know they existed in the Balkans for thousands of years, yet we only know timelines ranging to around 800BC and not much further back. Where did the other few thousand years of history go??? Precariously buried along the Balkan landscape, that’s where. So Ivo Andreev, a member of Earth’s International Research Society, along with Mike Tate, co-founder of the Geophysical Assessment and Investigation Association, traveled to Bulgaria for a Thracian research expedition during the Spring of 2013 to conduct intensive research of these tombs and the ancient land of the Thracian Kingdoms. Modern Scholars denounce the ancient Thracians as having any written language or any historical texts. Though there are many very factual references that the ancestors of the mid-late Thracians were the predecessors of the ancient Greeks, which is obviously who the early Romans were heavily influenced by. Even the Greeks themselves stake claim that the gods of their most ancient and sacred myths are clearly having ancient Thracian lineage and origin. In fact, this aspect is very well documented in Greek historical texts. So apart from what we know scientifically of the ancient Thracians and what physical evidences we have at this time, it inevitably seems that this is the “even more” ancient and “almost” lost culture of the Balkans of who the most ancient from beyond the civilizations of the Romans and the Greeks come from, and in fact the ancient Thracians were where these later civilizations drew their early influences from. The evidences points to the possibility of an Anatolian Origin dating back to thousands and thousands of years ago. Maybe even fitting into a possible Kurgan hypothesis as well. What exactly happened in this region 7,000-3000 years ago is what we intend to discover exactly. They say most of it is lost…we say no, maybe most of it just hasn’t been found. Here is where G.A.I.A. comes in. Geophysical Assessment and Investigation Association is a geophysical research branch of E.I.R.S. with the ability to create detailed analysis reports of 0-30 meters in depth. All our research is 100% non-destructive. Mission: Research various pre-planned coordinates. Result: Discovered and researched a cluster of 12 Mounds within 12 square kilometers. We conducted several non-destructive analysis procedures on many mounds involving electromagnetics and 3-D modeling software. In particular, we are using a new type of technology for sub-surface imaging applications incorporating FMCW radar, which is also found as a key component in aircraft landing procedures. This technique is far superior and further reaching than anything else available and we are among the first on earth to use this type of technology for geophysical ground analytics. The actual researching with our instruments is what took up most of our time. We acquired as much data as we could in a very short while. The mission was indeed a complete success. This mound looks to have been looted some time ago but our device shows positive readings of a structure creating an empty cavity with many reflections of precious metals still being inside the age old resting place of a unknown ancient Thracian king. We hope to find out who exactly it is and preservate for the people of Botunets, and the people of Bulgaria, a part of their historical culture that is on the verge of being forgotten. It seems we found something the looters missed all those years ago! In any case, we do not have permits to dig or excavate so that is not an option for us this trip. But our future plans to do what we can in this region has now become established. The artefacts and other valuable finds uncovered in this region is amazing. Sadly, there are many other locations around Bulgaria that at one time held precious tangibles like this museum but have now been looted. These locations are left destroyed and eventually begin to look overgrown and forgotten about. It becomes easy to see what is currently happening to ancient Bulgarian heritage and culture…An ever present decline of preservation. Overall, what we found is a rich and teeming cultural heritage slowly becoming lost to the annals of tumultuous times. In terms of cultural heritage and the preservation of these important ancient Thracian sites, it’s all too easy to see…the country needs help if help is available. We found several mounds, some with markers and some without, that seem to have been totally neglected and forgotten about. We even found many that were obviously looted some time ago and have now been left to wither away without the adequate attention or recognition. Granted there are areas of Bulgaria that are highly publicized and very well taken care of, such as Perperikon and the “Valley of Thracian Kings” among other sites, especially up into Varna…But by far and large, this country and the historical importance it holds is in desperate need of major heritage and cultural preservation. The looters have bulldozers and wait for no one, and academia has shovels and brushes if they can get through the paperwork and the permissions. It’s that simple. Our problem however are the sites that have already been destroyed. The looters demolish a mound and leave an aftermath of slight destruction, afterwards everyone including academia and even the local authorities turn away from it and leave it in this condition as if there is nothing that can be done about it. Then it is forgotten about and overgrown with shrubbery and trash. If we do not do something about this in 15 years these sites will not even be recognizable. Ultimately, what we discovered is that there are literally hundreds of ancient sites of historical importance. Some of them, at the current rate of preservation, will most definitely be lost and forgotten about within 50 years. What is the upside to all this? Well alot actually. One of the greatest things is the decision to create a separate not-for-profit organization (of which will include alliances with E.I.R.S. and G.A.I.A.) to usher in volunteers from all over the world, and especially in Bulgaria and the Balkans, for the efforts of Thracian Heritage and Culture Preservation in Bulgaria and abroad. The good part is that many of these sites still hold uncountable amounts of evidences and artefacts that are still completely invaluable to the scientific communities and to the discipline of Thracology itself. Even if only all the looted mounds themselves were cleaned up and renovated to not look like a destroyed Thracian site and turned back into something that can be appreciated as a recognition of world heritage, that in itself is a great achievement to be accomplished by volunteer forces. Not to mention all that we would discover along the way. The organization is called the “Thracian Preservation Alliance“. This project is in its infantile stages and still gasping for air against the authorities and their need of a drastic revision of the Cultural Heritage laws. However, we are still making connections to other various alliances and furthering our own inquiries. While our plans are swift and aggressive and our goals for 2013 are very attainable, it all depends on the support we receive from the around the world as well as the local authorities. We will be providing select volunteer expeditions in addition to our own ongoing research trips to the region. As well we have began applying for preservation funds through the various routes available. Donations are as of now being accepted and cooperations and collaborations are now being formed. If you are the least bit interested in the cultural and historical preservation of the ancient Thracians, not just in Bulgaria but in the whole Balkan region, then please get in contact with us. This is a very exciting time for anyone becoming involved right now! The Thracian Expedition was more than we could have hoped for with many positive results and future plans. If only the political side of things were that easy. That’s why it is paramount that the Thracian Preservation Alliance receives as much support as it can. They will need help, that is for sure, and they cannot do it on their own. They will need enthusiastic people who are driven with a purpose. People who can spread the word and stand with us, whether it be from home or actually there on location! We have a very unique opportunity to doing something important and meaningful and decent for the lost heritage and culture of the ancient Thracians. It is they who gave way to the most influential people and civilizations who shaped the world as we know it with their powerful history and became immortalized as gods among other cultures such as the ancient Greeks. Their history is still lost beneath the beautiful green valleys and magnificent mountainous terrain…and even beneath the debris of long looted tombs. They can all easily be venerated once again for it’s historical significance and become a true attraction of world heritage and cultural recognition…the ancient Thracians and their contributions to civil evolution and historical events truly makes them worthy of deserving it. Our efforts will take us beyond Bulgaria and into countries such as Romania and Macedonia and others as the Thracians once ecompassed almost the entire Balkan region. There is alot to do with very little time. Please message us if you are interested in just finding out how you can contribute. And money is not the main factor in this project, volunteering is. Email us today to see what opportunity lies for you. Please sign this petition for the Bulgarian Minister of Culture to allow us to clean a desecrated and looted Thracian mound. Thank you so much for your attention and thank you for reading! check out the links in the video’s description and the comments in the video. It is an interesting fact that the Jesuit order originated from the Basques, just as the Templars originated from the Celts. These Orders were integrated into the church out of necessity. You could not exist in medieval Europe without being Catholic.The Basques have been treated like a stepchild by the Catholic Church until it begin to crumble. Now in the age of enlightenment you have the first Jesuit Pope.